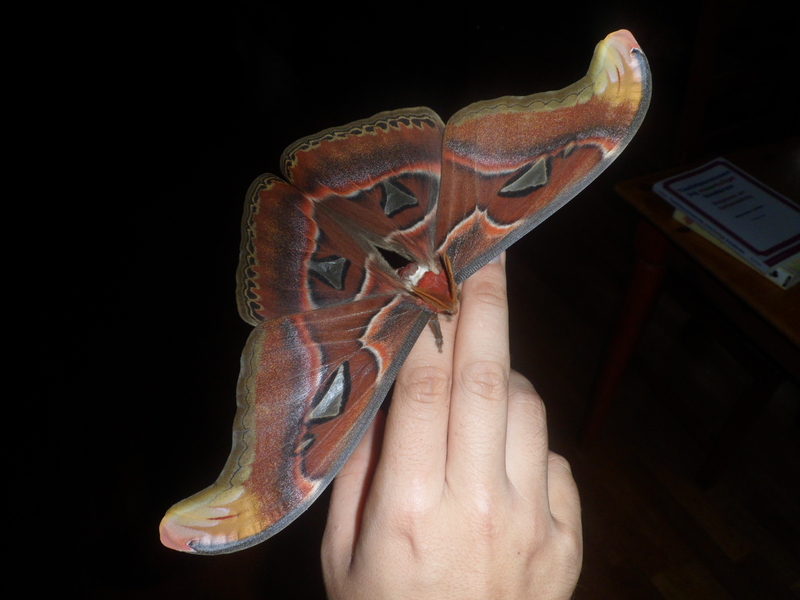 Attacus atlas — “Atlas moth” | Welcome, visitor! Attacus atlas, known as the atlas moth, is one of the largest moth species on this planet, if not already the largest. Originating from Asia, these moths have the biggest wing surface area of any known insect and are also among those with the largest wingspan. (25-31cm). They are truly magnificent insects. Unsuprisingly they are also one of the more populair moths in the breeding hobby. Difficulty rating: Average – Not the easiest but not hard. Wingspan: 190 – 260 mm – One of the largest Lepidoptera in the world, but there is a lot of size variation. The tips of the forewings are decorated with that seems like the head of a snake, which probably wards off potential predators. Also remarkable are the small transparent patches on the wings which resemble windows (for this reason they are called “fenestra” – latin for window). These transparent frames are theorised to break up the moths shadow by letting light through, as such a large moth tends to cast a very recognizable silhoutte. They can be found on many Saturniidae of the Attacini tribe however. Also very curious are the large caterpillars that are covered with a white and waxy powder. In their final instars they can consume large quantities of host plant. The waxy powder probably helps them become water-repellent. 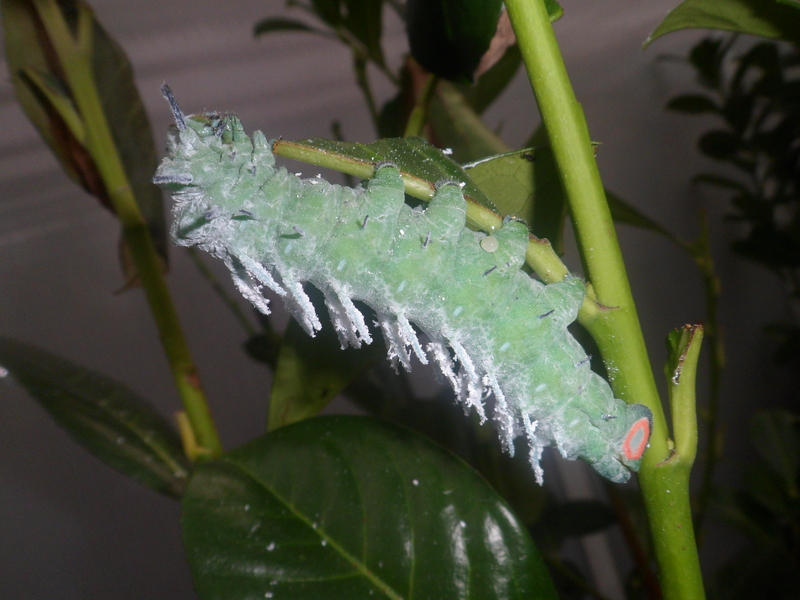 Atlas moth caterpillars are able to feed on a wide variety of plants, including Ligustrum sp. (privet), Prunus sp. (Cherries), Malus sp. (Apple), Ailanthus sp. (tree of heaven), Salix sp. (Willows), Citrus sp. (Citrus), Syringa (Lilac), and much more than I am able to to mention, so experimenting may be worthwhile. The hatchlings of Attacus atlas should be reared in closed plastic boxes with a little bit of ventilation up until the third instar. From the third instar and beyond, they require more ventilation and space (or they will get sick) and have to be caged or sleeved. Do not overcrowd them. After feeding for a couple of months and reaching their final instar, the larva will wander to find a suitable spot to spin its cocoon. 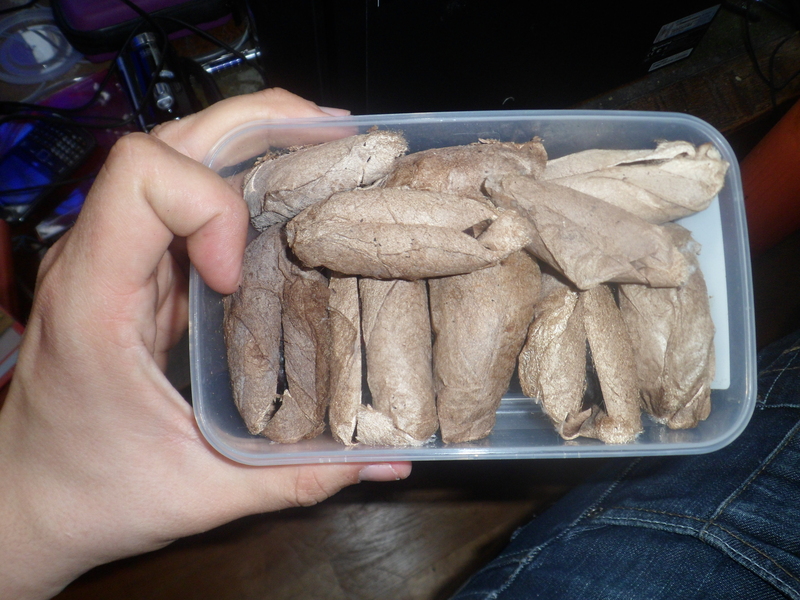 The cocoons are notably sturdy and brown. When emerging, the moth dissolves part of the silk casing by secreting an enzyme that burns a hole into the cocoon. In captivity however, I remove the pupae from the cocoons for optimal emergence. The wine-red pupa can stay dormant in diapause for quite a while, and it may take a few months up to over a year for them to emerge in some (extreme) cases. They have a facultative light-controlled diapause. 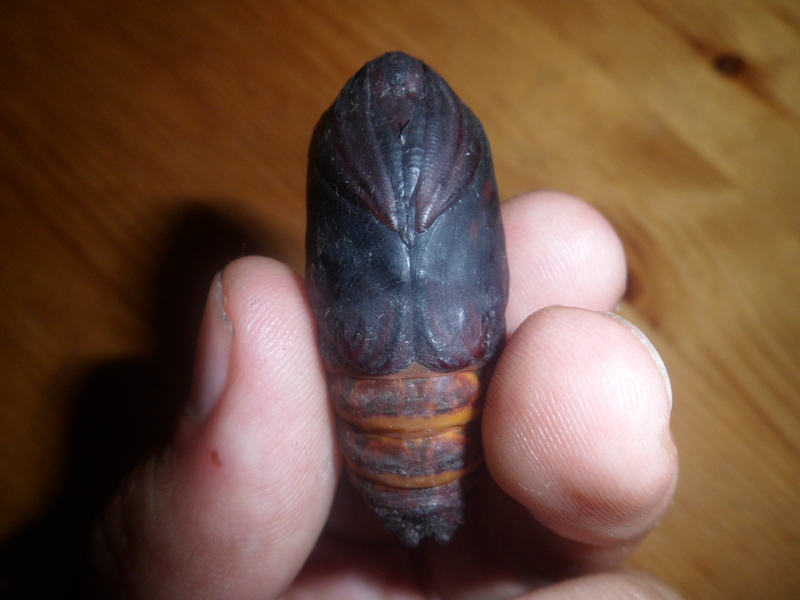 Before emergence the pupae turn a darker colour. These images include a stock of cocoons I purchased to try and breed, and a typical pupa ready to emerge. These moths emerge quite sporadically, which adds a significant luck factor to getting both a male and a female out to pair them, for the moths are short-lived. Pairing may be archieved naturally or via handpairing. A female moth will lay her eggs in random places, even on furniture and walls. They aren’t picky. Females will lay between 50 and 150 eggs (rough estimate). Bigger and fatter females produce more eggs. Males and females can be distinguished quite easily by the antennas, for the males antennas are much larger and thicker than that of the female. Males are generally much smaller and more slender. They also show different behaviour. These moths are quite easy in captivity if provided enough space and the right host plant, and patience. Caterpillars can be reared in boxes or open on potted plant, in a medium to low density. It is recommended to keep them above room temperature (22-20 celcius is optimal) and a bit humid. I think Ligustrum sp. and Prunus laurocerasus are the best plants to rear them on. Females are quite large and well-rounded. They often have wingspans larger than 24 centimetres. They have fat bodies and large wings. For archieving natural pairings, the best would be to place them in a dark, well-ventilated room with natural light (artificial light can disturb their biorythm. Do not handle the moths too much before the night you need them to pair. They are also VERY easy to handpair (one of the easiest). A handpairing tutorial is added to the bottom of this page. Males are much more slender – with thinner elongated wings. They are smaller insects with a smaller wingspan and they have thick feathered antennae. All in all, they are admirable and impressive moths. With a bit of patience and care they are worth the effort! The cocoons are so though that they are almost untearable ! 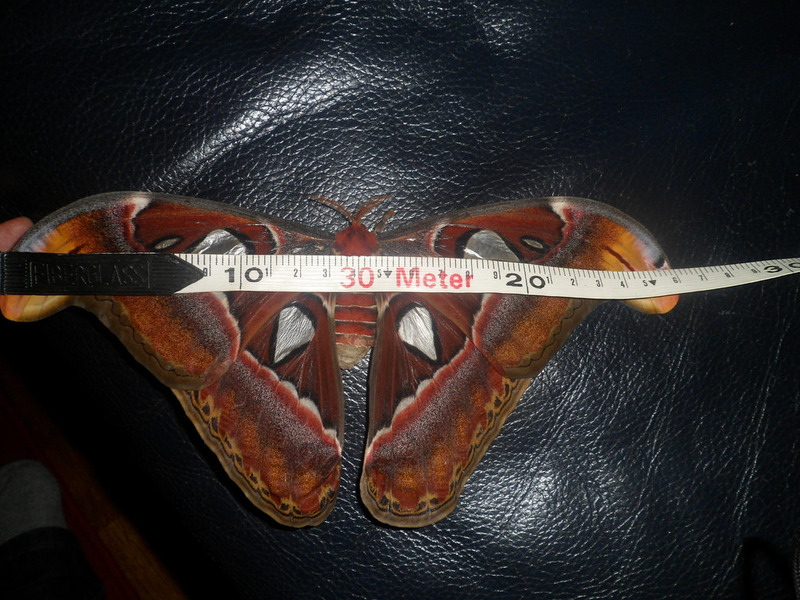 Believe me its easier to tear a piece of paper than the cocoon of the Atlas moth ! Extremely large lepidopterans are usually rare. The Queen Alexandra’s birdwing ( Ornithoptera alexandrae) and the Owlet moth ( Thysannia agrippina) are just examples. The Atlas moth is an exception.